Carpet & Furniture Cleaning for your home or business. Clean & Protect your furniture & carpets with NO Vat to pay!! All Carpet cleaning up to 50% off, Call now for a free quote. Book now to avoid disappointment as this offer will not last forever..
Residential/domestic properties only. Not for commercial property use. This amazing carpet cleaning offer does not run in conjunction with any other offers. 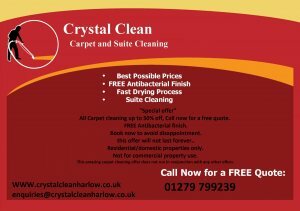 Crystal Clean Carpet Cleaning Harlow is Completely independent. That means extra competitive pricing but still with expert knowledge & service for clean carpets in your home or office. We only use the very best cleaning products and use multi method carpet, rug and suite cleaning - we don't rely on one method to clean all fabric and leather types. Crystal Clean Carpet Cleaning will use the best recognised technique, wet or chemical for the fabric be cleaned at the time, be that Leather sofa or leather suite, Rug or carpet.